sixth-order boundary value problems. We developed non-polynomial spline which contains a parameter $\rho$, act as the frequency of the trigonometric part of the spline function, when such parameter tends to zero the dened spline reduce into the septic polynomial spline, the consistency relation of non-polynomial spline derived in such a way that, to be fitted to approximate the solution of the given sixth-order boundary value problems. Boundary formulas are developed to associate with presented spline methods. Truncation errors are given, we developed the class of second, fourth, sixth and eight order methods. Convergence analysis has been proved. The obtained methods have been tested on nine examples, to illustrate practical usefulness of our approach. The results of our higher eight order method compare with the existing methods so far. Aslanov, A. A general formula for the series solution of high-order linear and nonlinear boundary value problems, Math. Comput. Model. 55, 785-790, 2012. Akram, G. and Siddiqi, S.S. Solution of sixth order boundary value problems using non- polynomial spline technique, Appl. Math. Comput. 181, 708-720, 2006. Behroozifar, M. Spectral method for solving high order nonlinear boundary value problems via operational matrices, BIT. Numer. Math. DOI 10.1007/s10543-015-0544-2, 2015. Boutayeb, A. and Twizell, E.H. Numerical methods for the solution of special sixth-order boundary value problems, Int. J. Comput. Math. 45, 207-223, 1992. El-Gamel, M., Cannon, J.R., Latour, J. and Zayed, A.I. Sinc-Galerkin method for solving linear sixth order boundary-value problems, Mathematics of Computation 73(247), 1325- 1343, 2003. Glatzmaier, G.A. Numerical simulations of stellar convection dynamics III. At the base of the convection zone, Geophysical and Astrophysical Fluid Dynamics 31, 137-150, 1985. Hayani, W.A. Adomian decomposition method with Green's function for sixth-order bound- ary value problems, Comput. Math. Appl. 61, 1567-1575, 2011. Henrici, P. Discrete variable methods in ordinary dierential equations, (Wiley, New York, 1961). Jalilian, R. and Rashidinia, J. Convergence analysis of nonic-spline solutions for special nonlinear sixth-order boundary value problems, Commun. Nonlinear. Sci. Numer. Simulat. 15, 3805-3813, 2010.
cient algorithms for fourth and sixth-order two-point non-linear boundary value problems using non-polynomial spline approximations on a geometric mesh, Comp. Appl. Math. DOI10.1007/s40314-014-0196-x, 2014. Khan, A. and Sultana, T. Parametric quintic spline solution for sixth order two point boundary value problems, Filomat 26(6), 1233-1245, 2012. Khan, A. and Khandelwal, P. Solution of non-linear sixth-order two point boundary-value problems using parametric septic splines, Int. J. Nonlinear. Sci. 12, 184-195, 2011. Lang, F.G. and Xu, X.P. An eective method for numerical solution and numerical deriva- tives for sixth order two-point boundary value problems, Comput. Math. Math. Phys. 55(5), 811-822, 2015. Noor, M.A. and Mohyud-Din, S.T. Homotopy perturbation method for solving sixth-order boundary value problems, Comput. Math. Appl. 55, 2953-2972, 2008. Noor, M.A., Noor, K.I. and Mohyud-Din, S.T.Variational iteration method for solving sixth- order boundary value problems, Commun. Nonlinear. Sci. Numer. Simulat. 14, 2571-2580, 2009. Pandey, P.K. Fourth order nite dierence method for sixth order boundary value problems, Comput. Math. Math. Phys. 53(1), 57-62, 2013. Ramadan, M.A., Lashien, I.F. and Zahra, W.K. A class of methods based on a septic non- polynomial spline function for the solution of sixth order two point boundary value problems, Int. J. Comput. Math. 85, 759-770, 2008. Siddiqi, S.S., Akram, G. and Nazeer, S. Quintic spline solution of linear sixth-order boundary value problems, Appl. Math. Comput. 189, 887-892, 2007. Siddiqi, S.S. and Akram, G. Septic spline solutions of sixth-order boundary value problems, J. Comput. Appl. Math. 215, 288-301, 2008. Siddiqi, S.S. and Twizell, E.H. Spline solutions of linear sixth-order boundary value prob- lems, Int. J. Comput. Math. 60, 295-304, 1996. Toomore, J., Zahn, J.R., Latour, J. and Spiegel, E.A. Stellar convection theory II: single- mode study of the second convection zone in A-type stars, Astrophys. J. 207, 545-563, 1976. Twizell, E.H. Numerical methods for sixth-order boundary value problems, Numerical math- ematics, Singapore, International series of numerical mathematics. Birkhauser Basel. 86, 495-506, 1988. Twizell, E.H. and Boutayeb, A. Numerical methods for the solution of special and general sixth-order boundary value problems, with applications to Benard layer eigenvalue problem, Proc. Royal. Soc. Lond. 431, 433-450, 1990. Ullah, I., Khan, H. and Rahim, M.T. Numerical solutions of fth and sixth order nonlinear boundary value problems by daftardar Jafari method, Journal of Computational Engineering (Hindawi), Article ID 286039, 2014. Usmani, R.A. Applied linear algebra, (Marcel Dekker, New York, 1987). fied decomposition method, Appl. Math. Comput. 118, 311-325, 2001. ISNAD Farajeyan, K. , Rashidinia, J. , Jalilian, R. . "Convergence of the class of methods for solutions of certain sixth-order boundary value problems". 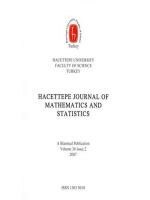 Hacettepe Journal of Mathematics and Statistics 46 / 5 (October 2017): 835-849.